How Dan lost his legs. I shot this portrait in early May of Dan McCleary, Founder of the TN Shakespeare Co., for an article in the upcoming Summer ’09 issue of the magazine, Shakespeare Scene. 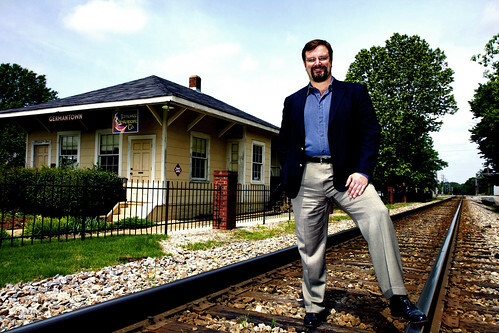 The story focus on how the city of Germantown allowed Dan to use their historic rail station as the temporary main office for the company. Dan is doing some great work with TN Shakespeare, it has been fun to a part of it, even if sporadically. I was kind of pumped about this because it was going to be my first published work in an international magazine. About a month ago, I received an email from the editor saying that one of their advertisers was actually a train company and they had to send them a proof of the entire edition. Their “health and safety” people for this train company became very unhappy with the fact that Dan was standing on the track because it was some sort of “safety risk.” So, of course the magazine yields to the advertiser and chops off Dan’s legs to remove the tracks without informing me until after the fact. Personally, it seems like a greater health risk to amputate a person in a photo than to show them standing on an empty track to give the image some compositional flavor. But what do I know, I’m just some photographer. It’s a real tragedy, but that’s the world we live in right. It was a learning experience for me at least, because next time I’m going make sure to include something about creative control in the contract. Well, the edition of Shakespeare Scene should be out in your nearest Barnes & Noble or Borders bookstore by now, so go see the damage for yourself. I think the photo is on page 28.